Ashley Arp is the marketing and social media manager for Tiny But Mighty Popcorn, a family-owned business based in Shellsburg, Iowa. Farmer Gene and his wife Lynn – the company’s founders (and Ashley’s uncle & aunt) – grow, manufacture, package, and sell a unique heirloom variety of popcorn. 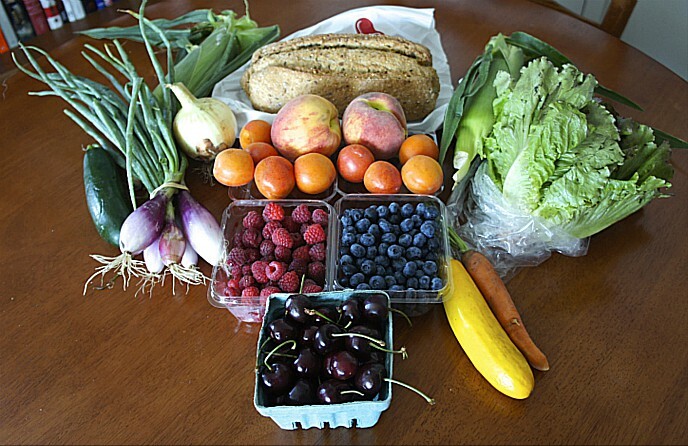 All of their products are non-GMO, gluten-free, vegan, kosher, and grown with organic farming practices. It’s an exciting time to be in Chicago. Not because of the endless opportunities for snow angels, or because it happens to be Restaurant Week. It’s because we’re a little more than a month away from one of the most important and innovative events that takes place in the city of Chicago — one that everyone in the surrounding areas and beyond should know about, particularly those who care about Good Food. 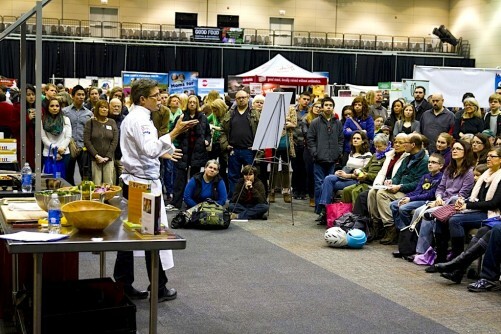 It is the 11th annual Good Food Festival & Conference presented by FamilyFarmed, a Chicago-based nonprofit organization that is one of the leading proponents of the fast-growing Good Food movement. Ashley Arp represented Tiny but Mighty Popcorn at a July 2014 event introducing FamilyFarmed’s Good Food Business Accelerator. Who will be attending this Fair? Entrepreneurs in the business of locally grown, sustainably produced food, who grow, produce, manufacture, package, or sell. FamilyFarmed’s ground rules for participation are that a business must be located in and serve the Chicago foodshed, and its core business values must align with Good Food values. Over the past few years, Financing Fair participants have raised $11 million in debt and equity financing to build their businesses. The Fair is an indispensable opportunity to connect with the decision makers in the food industry. The results can be life-changing. 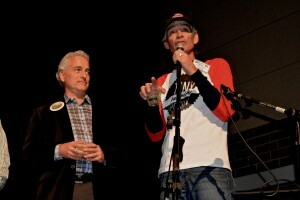 Gene Mealhow, farmer and founder of Tiny But Mighty Popcorn, on right, with Jim Slama, president of FamilyFarmed. 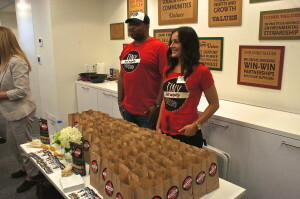 Just ask Farmer Gene Mealhow of Tiny But Mighty Popcorn, the company for which I work. Farmer Gene had the privilege of working with FamilyFarmed President Jim Slama and his team in a similar capacity to help launch his company, long before Tiny But Mighty’s products turned up on the shelves of Whole Foods Market stores and other retailers across the country. Gene stressed that it was the guidance and insight given through FamilyFarmed’s auspices, combined with the opportunity of being put in the same room with so many key players in the food world, that really locked in his success. Farmer Gene Mealhow with Tiny But Mighty’s popcorn products at FamilyFarmed’s 2014 Good Food Festival. “The people we were connected with in that capacity — there’s nothing like it. They essentially cut out the middleman and you get to speak face-to-face with the decision-makers, the investors, which is exactly how it goes at the Financing Fair,” Farmed Gene recalled. Tickets for the Financing & Innovation Conference and the rest of the Good Food Festival & Conference are on sale now and can be purchased here. 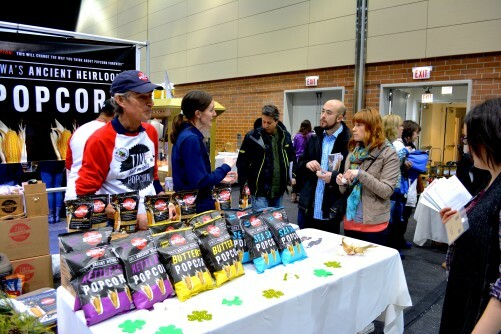 You should come hear Farmer Gene speak about his Tiny But Mighty Popcorn experiences on a panel, “Getting on the Shelves,” at the event’s Good Food Trade Show on Friday, March 20 from 4 p.m. to 5:15 p.m.
And once again, Tiny But Mighty will be there — popcorn in hand — in the Exhibit Hall at the Good Food Festival on Saturday, March 21, the big public event celebrating the progress of the Good Food movement! This entry was posted in Butchering, Farm to school movement, Fast/casual restaurants, Food Hubs, Food labeling, Food obsession, Food safety, Good Food marketing, Hunger assistance, Meat, Poultry, Sustainable food systems and tagged FamilyFarmed, food artisans, Food Entrepreneurs, Food entrepreneurship, Gene Mealhow, Good Food Business Accelerator, Good Food Festival & Conference, Good Food movement, sustainable food, sustainable food retailing, Tiny But Mighty popcorn. Bookmark the permalink.